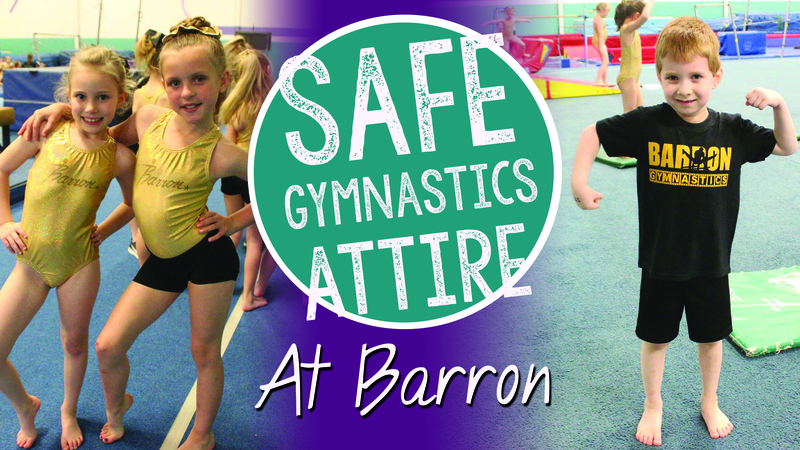 Barron’s dress code is set up with your gymnast’s safety in mind. Read on for the reasons why the following items are part of our dress code policy. Leotard For Girls – Leotards are the standard gymnastics uniform. Leotards provide full freedom for movement without extra baggy clothing getting caught on equipment or slipping through the coach’s hands for spotting skills. Proper gymnastic leotards cover the full torso and do not have skirts attached. Snug shorts or leggings are optional. Gymnasts should have their midriffs covered at all times. Having a leotard that covers the gymnast’s midsection allows a safe place for coaches to spot skills without their hands slipping. Covering their midsection also eliminates the potential for injuries to their stomach skin on the bars, beams, trampolines and more. While leotards are the preferred gymnastics dress code, girls may also wear athletic shorts and a snug fit tank or T-shirt that can be tucked in. We carry the proper gymnastics leotards and shorts in our gift shop for your convenience. Athletic Shorts & T-shirts That Can Be Tucked In For Boys – Athletic shorts should not have zippers, snaps, buttons or free dangling strings to avoid getting caught up on equipment. Gymnasts spend a lot of time upside down. Tucking in their T-shirt keeps it from flipping up and covering their face when inverted. It also provides a smooth torso so coaches don’t get their hands caught up or slip on the fabric when spotting skills. Bare Feet – Bare feet provide the safest experience for gymnasts. It allows them to feel the surfaces of different mats and equipment improving their balance and agility. Socks can be a slip hazard on our beams, trampolines, floors and springboards. Shoes damage equipment and can increase the chance for rolling an ankle on our soft surfaces. Long Hair Tied Back & No Jewelry – Hair should be tied back to keep it out of the gymnast’s eyes when inverted and rolling or flipping. If you ever forget a hair tie, just ask at the front desk. We keep spares on hand for safety. Jewelry (including fitbits) should be removed before entering the gym. This keeps gymnasts from getting injured by jewelry caught on equipment or coaches. We also don’t want you to break or lose your valuables while in class. We do allow stud earrings to be worn. A SMILE – A smile to complete your uniform means you are ready to learn, grow, and HAVE FUN!